Sideswipe collisions happen when a driver leaves his lane and the side of his vehicle strikes the side of another driver's vehicle. If you were injured in a sideswipe accident caused by a careless or inattentive driver, you can seek compensation for your damages in a personal injury claim. The driver doesn’t check his blind spots and verify that a lane is clear when trying to make a lane change. The driver may be trying to merge into traffic from an on-ramp without enough space to safely do so. The driver may be intoxicated or under the influence. The driver may be fatigued and starting to nod off while driving. The driver may have spotted a road hazard and overcorrected the steering wheel. The driver may start to hydroplane on a wet or icy road. The driver is being aggressive and unsafe due to road rage. The driver is eating, texting while traveling, fiddling with the radio, or chatting with passengers and veer out of his lane. The severity of the accident depends on a few different factors. If both vehicles are traveling in the same direction at roughly the same speed and neither driver loses control, the accident may involve property damage and very minor injuries. However, if either driver loses control of his vehicle, serious injuries can result. Speeding greatly increases the risk of losing control during a sideswipe collision. Sometimes, a sideswipe collision will push a vehicle far enough to cause a collision with a guardrail, pole, tree, sign, or additional vehicle. This second collision further increases the risk of injury. In heavy traffic areas, it could start a chain reaction collision where several different people are injured. Sideswipe collisions can result in serious injuries because the impact is occurring at the side of the car in areas where there is less protection from the force of the collision. 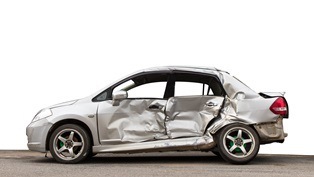 Cars are designed to provide maximum protection in the event of head-on and rear-end collisions. A personal injury claim is a type of civil suit seeking monetary compensation from the driver at fault for the accident. Types of damages in a personal injury suit include medical expenses, lost wages, and pain and suffering. If you were left with a permanent disability due to injuries sustained in the collision, you can also seek compensation for anticipated future medical costs and/or loss of future earning potential. Typically, the driver who veers into another driver's lane is responsible for the accident. However, when accidents are occurring at high rates of speed, witnesses may give conflicting accounts of who is responsible. If you are partially at fault for the accident, you can still receive compensation. Your settlement will simply be reduced by your assigned percentage of fault to reflect your responsibility for the damages that occurred. Retaining the services of an experienced personal injury attorney can help ensure that you receive a settlement that will adequately compensate you for your damages. Your attorney can gather the necessary documentation of your expenses, establish liability for your injuries, and negotiate with the insurance company on your behalf. It is understandable to be worried about the cost of legal representation if you are unable to work due to your injuries. However, personal injury attorneys accept cases on a contingency fee basis. This means, no money is due up front. Your attorney will ask for a percentage of the final settlement as the fee for service.